This Chamberlain 750CB compatible single button visor remote control unit made by Transmitter Solutions can replace all Chamberlain remote controls that use 9 dip switches for programming and operate on the 390 MHz radio frequency. Programming is simple just set the 9 (+/0/-) dip switches to match your existing remote control or actual door opener and you'll be ready to go. 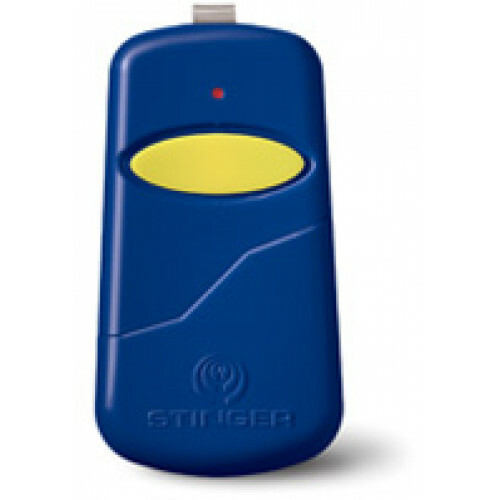 This unit will also work on openers made between 1984 and 1992 that have YELLOW, GREY, or WHITE learn buttons. 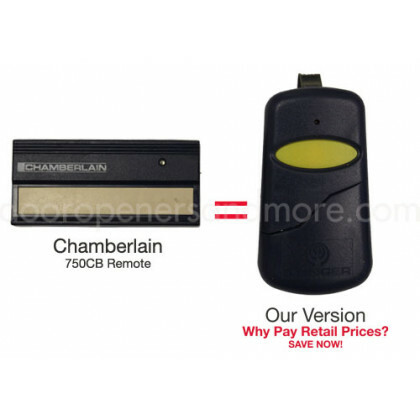 This Chamberlain 750CB compatible single button visor remote control unit made by Transmitter Solutions can replace all Chamberlain remote controls that use 9 dip switches for programming and opera.. This Chamberlain 750CB compatible single button mini key chain remote control unit made by Transmitter Solutions can replace all Chamberlain remote controls that use 9 dip switches for programming .. These Chamberlain 750CB compatible single button remote control units made by Transmitter Solutions can replace all Chamberlain remote controls that use 9 dip switches for programming and operate o.. This Liftmaster 61LM single button visor remtoe control can control one gareage door or gate opener that use the 8 or 9 dip switch style remotes made between 1984 and 1992. Can also work on o..